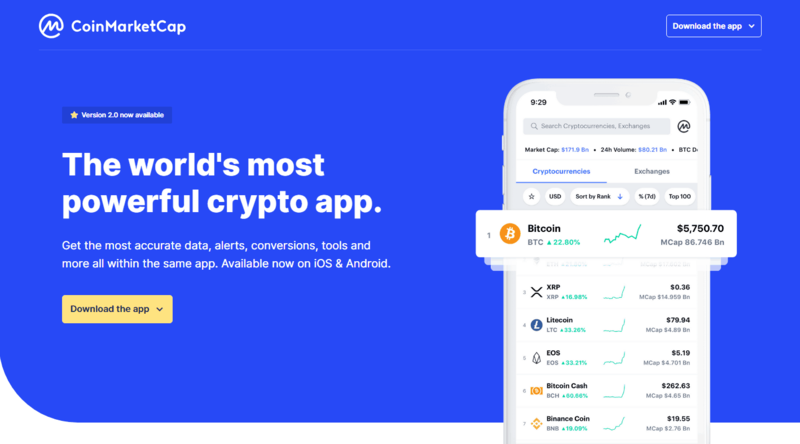 Coinmarketcap, one of the leading cryptocurrency data information platforms launched its mobile app for Android and iOS users a few hours ago. CoinMarketCap, one of the leading cryptocurrency data information platforms launched its mobile app for Android and iOS users yesterday. The mobile app will make it easier for users to track prices, trading volumes, and the activity of over 2,000 cryptocurrencies. Cryptocurrency data information platform, CoinMarketCap (CMC) announced the launch of its mobile app on April 16, 2019. In a blog post, CoinMarketCap described the mobile app as the most powerful one in the cryptocurrency space. The CMC app allows users to get accurate data, alerts, conversions, tools and more all within the same app. It is available to download for both Android and iOS mobile device users. The platform added that the mobile app is essential for those who invest or trade digital currencies as it enables them to track over 16,000 cryptocurrency markets. With the mobile app, investors will be able to track the performance of the assets in their portfolio while also viewing crypto prices in fiat currencies like the USD, EUR, JPY, KRW, CNY, and more. In addition to tracking prices, users can set up the app to give them price alerts. Users will get notified once a set price target is reached, enabling users to make more informed and precise decisions regarding their cryptocurrency investments. CMC noted that alerts could be set for any of the over 2,000 cryptos available on its platform. The CMC app also has a conversion feature that allows users to convert crypto to crypto, crypto to fiat, or digital currencies to precious metals. Conversions can be done using the price converter available on CMC. Cryptocurrencies can also be compared based on their price, market cap, trading volumes, and more. The comparison feature will make it easier for crypto enthusiasts to assess the performances of cryptos. The last feature available on this app is news. Users can follow stories based on their portfolio as the CMC app is designed to display news relevant to a user’s interest. BitWise Asset Management issued a report to the United States Securities and Exchange Commission last month stating that 95 percent of Bitcoin’s daily trading volume displayed on CMC is false. The asset management firm argued that the trading volumes recorded by unregulated exchanges on CMC are either incorrect or non-economic in nature. According to the firm, the daily Bitcoin trading volume is roughly $273 million, not the $6 billion displayed on CoinMarketCap. BitWise said the real Bitcoin trading volume is lesser, more orderly, and more regulated than the towering figure recorded on CMC. With the recent surge in Bitcoin price, the daily trading volume recorded on CMC has increased over the past three weeks and currently stands at around $11 billion. Despite the report by BitWise, CMC remains the most popular cryptocurrency information platform.